It was Sophie’s birthday the other day. We went out en famille for a Chinese meal at Sweet Basil in Kirk Hammerton. Sophie wanted a strawberry cake, so I felt like trying something a bit old-fashioned. Before Bird and Dr Oetker independently came up with the idea of baking powder to put the fluff into your cakes through a bit of basic chemistry, cakes were made with more eggs and the air was physically put in through some hard grafted whisking. Cakes were generally less light, but had a lot more body to them. I also think that these old-fashioned cakes tend to soften over time rather than dry out as much as more modern cakes. This little cake looks pretty, dressed in fluffy white cream and gorgeous pink strawberries, and is full of that extra rich taste from a profusion of eggs. I like it much more than your typical sandwich type cake, and it is not much more complicated to make. Start by preparing two 20cm/9 inch round cake tins: lightly grease the tins, then line with base with some baking paper. Sieve the plain flour then set it aside. Add the caster sugar, eggs and vanilla extract into a heatproof bowl. Boil a kettle of water and put into a pan, then reheat it until simmering. Put the heatproof bowl with egg-sugar mix over the simmering water, using a hand-held electric whisk at the highest level for 5 minutes. This will increase the volume to around three times the initial level and the colour to a creamy yellow colour. Scoop about one-third of the sieved plain flour over the egg-sugar mixture, then using a big metal spoon fold the flour into the mixture. Repeat for the remaining two thirds of plain flour. Next drizzle the cooled liquid butter into the mix in thirds again, folding in carefully each time. The key is do the minimal of folding to keep the air in the egg-sugar mixture as much as possible. Pour the mixture into the prepared tins and then bake for 25 minutes. Leave in the tins for a few minutes before turning out the baked tin, and allow it to cool down fully. Firstly, I spooned some strawberry jam onto one of the cakes – not too much, but enough to stick the two cakes together. Then I put the two cakes together. Secondly, I whipped some cream with the vanilla sugar – pour the cream into a mixing bowl, then whisk until getting harder, when you should sprinkle over the caster sugar; whisk some more until the cream makes soft peaks. 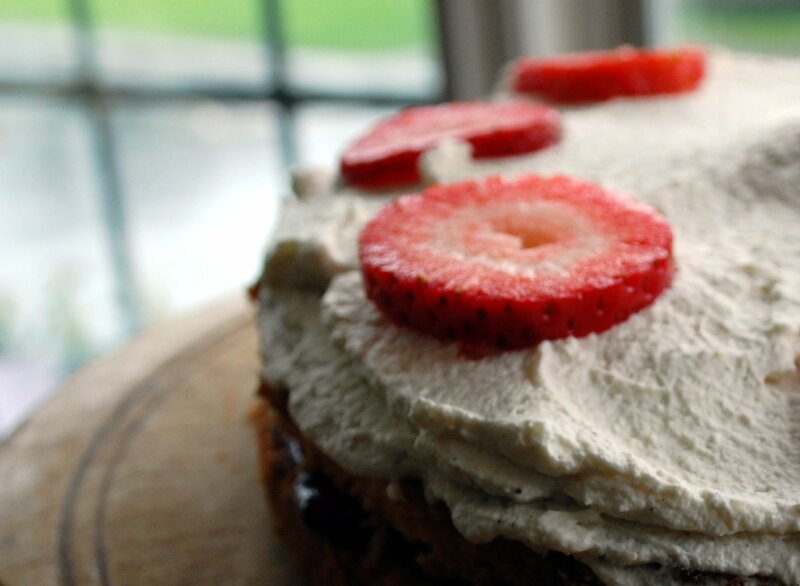 Scoop and smooth over the top of the cake, then arrange the chopped strawberries in the whipped cream. Enjoy on its own, or with a delicious cup of Earl Grey tea or First Flush Darjeeling.